The Colorado River is a tightly controlled network of dams and diversions, spanning seven states in the U.S. and two in Mexico, providing water for fish and wildlife, agriculture, industry, and cities along the way. More than 35 million people depend on the Colorado River basin for at least part of their water supply. Yet the river is so over-appropriated that it usually fails to flow to the sea; altered flow regimes, depleted water levels, and degraded water quality have pushed many species to the brink of extinction, leading the Colorado to be named America’s most endangered river. Two years ago the Pacific Institute provided compelling data on Municipal Deliveries of Colorado River Basin Water, documenting the impressive water-efficiency gains made in many of the cities served by the river. Recently, the Institute released a report on irrigated agriculture called Water to Supply the Land: Irrigated Agriculture in the Colorado River Basin. Although information on irrigation in the Colorado River basin exists in different forms in various different reports and sources, this information previously was not available in one place. This deficiency was the primary motivation in creating Water to Supply the Land. Fundamental questions such as, Where is Colorado River water going? What’s being grown in the basin? And how much water is being used to grow these crops? could not be readily answered – Water to Supply the Land seeks to fill that gap. Water to Supply the Land compiles and compares data from state and federal agencies on irrigated land and water use. Frequently the data amongst these agencies are inconsistent, because of differences in methods, timing, and geographic scope. The report highlights these inconsistencies and recommends greater cooperation, especially among federal agencies. The report finds that more than ninety percent of pasture and cropland in the Colorado River basin receives supplemental water to make the land viable for agriculture. This irrigated land extends across some 3.2 million acres within the basin, while water exported from the basin reportedly helps irrigate another 2.5 million acres in Colorado, Utah, New Mexico, and southern California. Irrigating this much land requires a lot of water, consuming roughly 70 percent of the basin’s water supply (not including evaporation or exports). 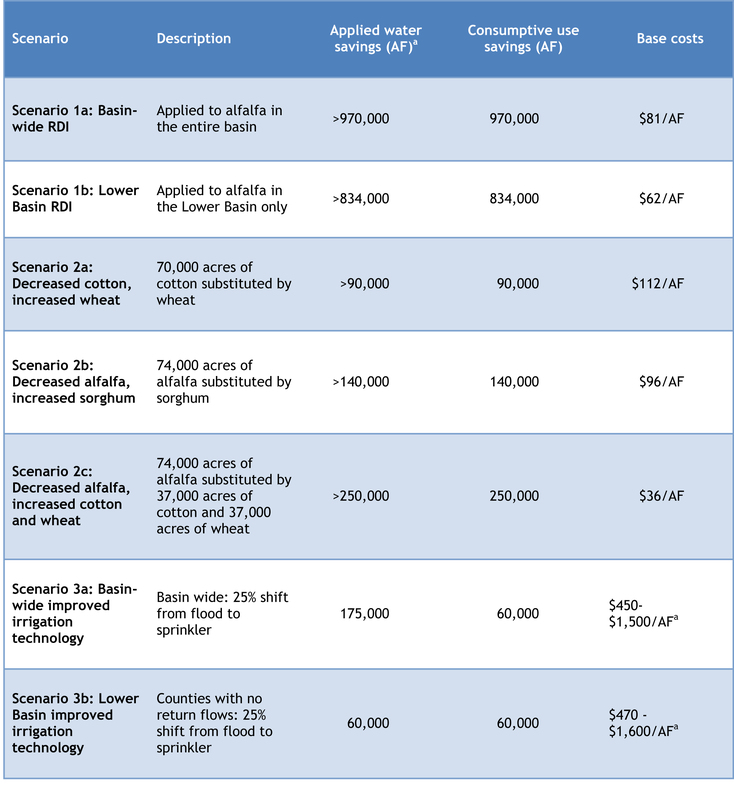 One of the prominent features of the report is a series of scenarios that explore different methods to make irrigation more efficient (see Table 1). Many of these scenarios require other interests – like municipal and wildlife agencies – to compensate irrigators for adopting these new methods. Several of the scenarios are especially encouraging because they find that a substantial volume of water could be conserved at relatively low cost, using methods already in practice in various parts of the basin. Water conserved by these methods could go toward meeting unmet demands within the Colorado River and its tributaries and in cities, and to increase storage to offset or delay future shortages. The report recommends that growing municipal demand first be addressed by improving municipal water conservation. As cities improve their water conservation rates, regulated deficit irrigation may be implemented most appropriately as a drought response measure, keeping land in production while transferring some portion of the irrigation water requirement to cities struggling with significant shortages and to streams facing greatly diminished flows and threatened aquatic species. Crop shifting could also be implemented in the context of projected water shortages, incentivizing willing producers to plant less water-intensive crops and transfer a portion of the resultant water savings to improve supply predictability for cities or other irrigators. Read Water to Supply the Land in full here.